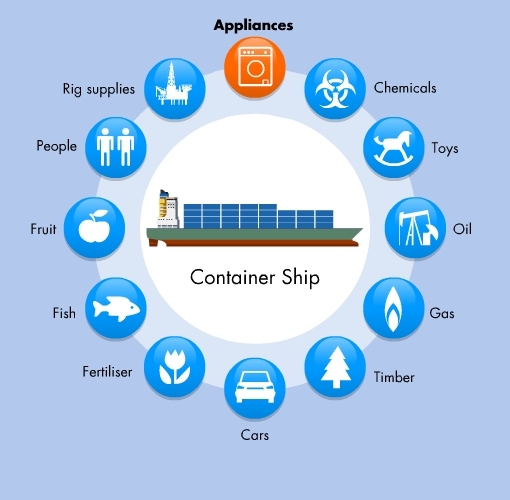 Containerships and their cargo of containers have revolutionised the shipping business. Since the first movement of containers back in 1956, this branch of the maritime business has grown phenomenally, becoming an integral part of the door-to-door international movement of goods and products. Making just a short journey by road, you are certain to pass a container travelling from or on its way to a container depot, and that will be just one of the millions of containers that are handled by ports and terminals around the world every year. Containerships are designed to fit containers with standard measurements, with each one slotting into guides on the ship like pieces of a giant jigsaw puzzle. The carrying capacity of containerships, colloquially known as boxships, is measured in twenty-foot equivalent units, or TEU. Simply, this is the number of 20-foot containers that a ship can carry. These ships have been steadily growing in size and today the largest containerships afloat can carry 14,500 TEU, or 14,500 20-foot containers. Known as a Suezmax ship, this ship represents the maximum dimensions for Suez Canal transit. The next stage in containership design will be the Malaccamax ship, capable of carrying 18,000 teu and the maximum size for the Malacca Straits.